The Lutterworth in Bloom competition was back for 2015 after a year off and the nominations came in thick and fast from across the town. Judging took place during some of the season’s best sunshine on Wednesday, August 5. 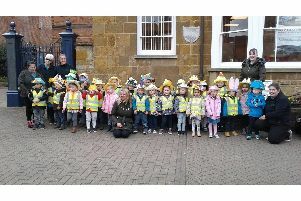 “If the weather was something to enjoy then the quality of entries for the competition was something to take your breath away,” said Holly Guy, from contest organisers Lutterworth Town Council. It was a hard-fought contest and the judges – the town’s Mayor Cllr Tony Hirons, with Ron and Hazel Cobb formally of Ashby Parva Plant Centre – had a very difficult task in reaching their decision. Their comments were that the colours, combinations and originality of the planting was some of the best they had seen. With a new Best Allotment category for this year, the judges were spoilt for choice with all the variations of veg, flowers and fresh produce to chose from. n Best Allotment – Mr George Turner (from the De Verdon Road allotments). n Best Hanging Basket or Container (public or private) – Jane Patel of Oakfield Avenue. n Best Public Garden – The Shambles pub in Bell Street. n Best Private Garden – Jean Smith of Woodway Road. The prizegiving ceremony took place at The Shambles on Tuesday last week where the winners gladly received a trophy, certificate and garden centre vouchers.